Army veteran Angie Peacock has come a long way since that time in her life, when anticipating death was the ominous thread that snaked its way through her days. Now, her day-to-day feelings are the opposite. She knows she will make it through any challenge thrown her way thanks to the courage she has developed through her commitment and involvement with Wounded Warrior Project® (WWP). But it wasn’t a simple journey. From the beginning of Angie’s first deployment, high stress was standard. Lots of driving and equipment repair structured her days, but part of her job also involved worrying about bombs and improvised explosive devices (IEDs). “You don’t just go to work; there’s no such thing as an ordinary day,” she said. Along with her stress and anxiety, Angie began to have physical health ailments that wracked her body, and compounded the intensity of her mental health struggles. A gastrointestinal infection brought her down to a scary 100 pounds. Her already stressed, exhausted body was assailed by nosebleeds, high blood pressure, palpitations, and fainting. All of this led to depression…then panic attacks. Despite this, her ambition to serve never wavered. She kept fighting, fulfilled missions, and called on extraordinary focus to follow orders to the letter. “I just prayed I wouldn’t die. That’s really all you can do,” she said with a sigh. After getting medevaced when her health was at a desperate point, Angie’s post-traumatic stress disorder (PTSD) was just beginning, but she also considers it the start of her healing journey. Angie also explained part of her PTSD and depression included crying for no reason, but when she needed to cry, she couldn’t. Everything got jumbled up, she said. Self-medicating to escape the pain of her combat experience started her on the dark path to addiction: she began abusing prescriptions and opiates as her battle for sanity and peace spiraled out of control. Still, she wasn’t totally comfortable on this path to healing, even though it was something she wanted for herself. “When I first joined WWP, I felt like I didn’t belong because I wasn’t visibly wounded,” Angie said, a perspective common among many wounded veterans who do not display visible wounds. It is an unfortunate misconception that keeps many from getting the help they need … and deserve. With that relief came a sense of belonging that eludes so many warriors once they return to civilian life. It can be difficult knowing how to overcome isolation and rekindle bonds similar to those formed in the military. That’s where WWP’s free programs and services play a role in the recovery process. 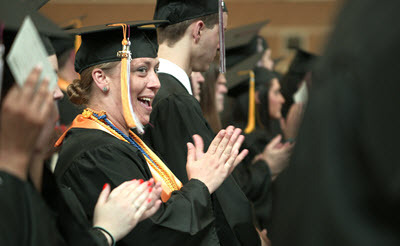 WWP’s Physical Health and Wellness programs are what resonated with Angie the most. 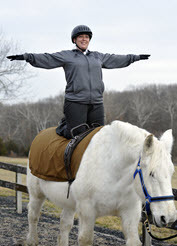 She started doing equine therapy, and that was a pivotal experience to get her body back after enduring years of physical pain. After three years of that, she progressed steadily by starting yoga then moving into CrossFit®. Angie saw the power of the mind-body connection; she said exercise significantly helped her overcome her mental health hurdles. Meditation provided yet another key element that propelled Angie toward a full recovery. Eventually, WWP asked Angie to become a peer mentor. Once she overcame her initial hesitance, it came very naturally. She also formed a veterans group when she went to St. Charles Community College because she recognized the importance of an outlet for veterans to bond with each other. That is only one of many examples of how Angie has used the leadership skills she honed in the military to enrich her civilian life. 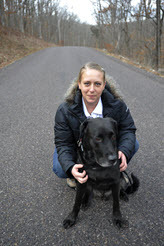 Angie is almost done with her bachelor’s degree in psychology now and plans to pursue her master’s in social work next so she can assist veterans with PTSD, traumatic brain injury (TBI), addiction, and recovery. Angie has already helped a lot of people and has been an example to many, and that’s why she won the WWP George C. Lang Award for Courage in 2015. She was surprised that she was the recipient. The George C. Lang Award is given to someone who exemplifies humility and advocates passionately behind the scenes for all service members – especially those with both visible and invisible wounds.